Good LAWD it has been a while since we last spoke, we’ve missed you terribly! Sometimes you have to fade into the background for a minute in order to reemerge new and rejuvenated. Life just keeps happening and you’ve got to learn to roll with it. And sometimes you get married…did I mention I got married last September?! The band TURNS 10 YEARS OLD on May 31st, 2018! Time FLIES when you enjoy each other’s company and creativity! We’ve been in the studio with Grammy Award winner Alan Sanderson @ Pacific Beat Recording working on some MUSIC for your ears, heart, and soul. You might remember Alan from having worked with us on our first album “From the Hip.” WE LOVE THIS MAN. May 29th is our last date in the studio, so watch out for that new music coming your way! Our CD RELEASE PARTY will be taking place on Saturday July 28th @ Bar Pink in North Park (San Diego) from 7:30-10:30pm featuring The Lyrical Groove opening the night. 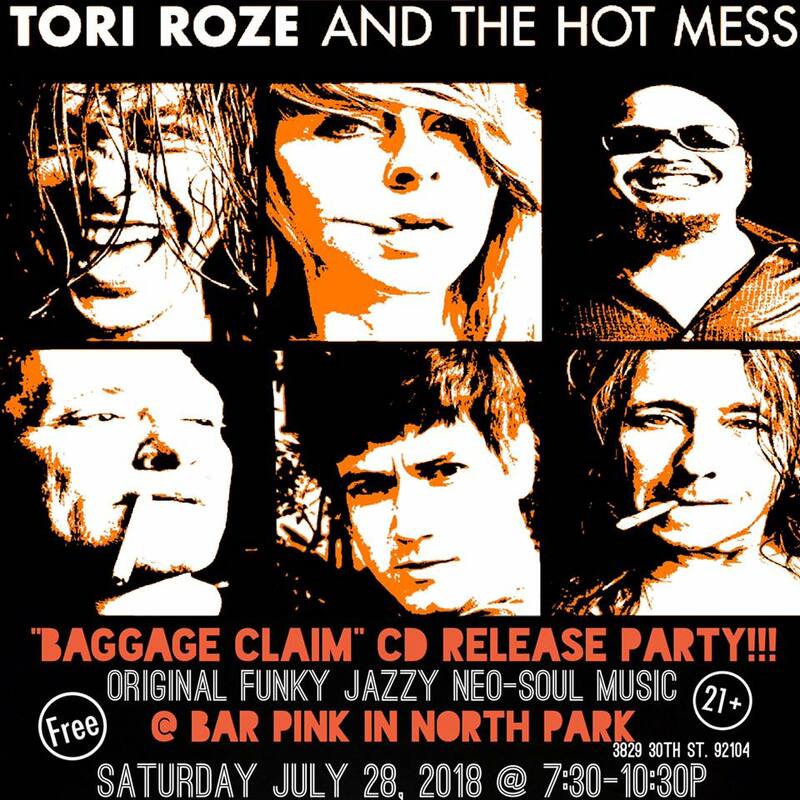 Tori Roze and The Hot Mess will be playing the new album in its entirety. We will have TONS of new merchandise including stickers, CDs, T-Shirts, digital downloads, posters, and more! In addition, our album artist, the fantastic Mark Adams, will be selling his incredible artwork. Make plans NOW, this is a FREE SHOW!!! HUGE THANKS to Cathy Spicer-Sitzes for making this beautiful BRAND-NEW WEBSITE for us, we love you lady. As always, thank you for coming along on our journey. We couldn’t and wouldn’t want to do it without you! Keep growing and evolving, we promise to do the same…and we will see you on July 28th @ Bar Pink from 7:30-10:30pm!! !